"Why I wouldn’t want to be without Scopus"
In his role as Editor-in-Chief of the Journal of Economic Behavior & Organization, Professor William S Neilson relies heavily on the information contained in Elsevier’s Scopus – the largest abstract and citation database of peer-reviewed literature. In this article he explains why he finds it so useful. Editors have many responsibilities, but the greatest one may well be separating those manuscripts having enough interest to warrant publication from those that do not. This becomes especially hard when one edits a journal with broad scope, too broad for any single person or small team to master. Nevertheless, publishers give editors this responsibility, and we must find a way to perform this sorting process. How do we judge an article’s interest when we are unfamiliar with the literature? 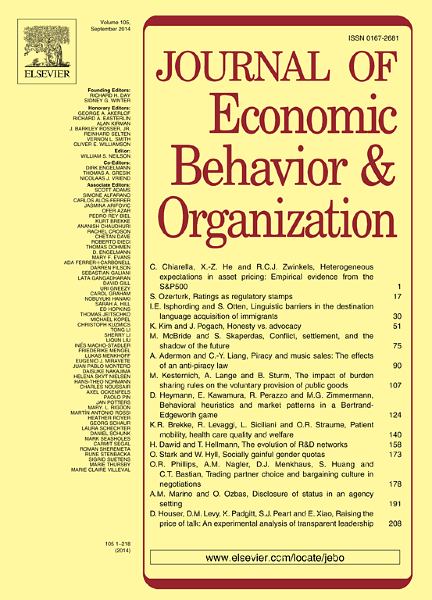 I edit the Journal of Economic Behavior & Organization (JEBO), which fits into the above categorization of a broad journal. JEBO is an economics journal that receives papers from across the spectrum of economic specializations as well as from finance and management. The manuscripts use all the different tools at an economist’s disposal from mathematical or computational to empirical or experimental. Individual researchers typically specialize in a topic-technique pair, so no single person could have expertise in everything our authors do. Furthermore, JEBO is a large journal; each year we receive more than 1,000 new submissions and publish more than 150 articles. Every new submission begins with a step in which I determine whether the paper is too narrow to pursue or potentially interesting enough to send on for review. Those in the former category receive desk rejections. While I have accumulated expertise over many of the topics covered by the manuscripts, I cannot claim it in all of the narrow literatures in which these papers hope to contribute. Scopus allows me to compensate for this, and I use it almost daily. 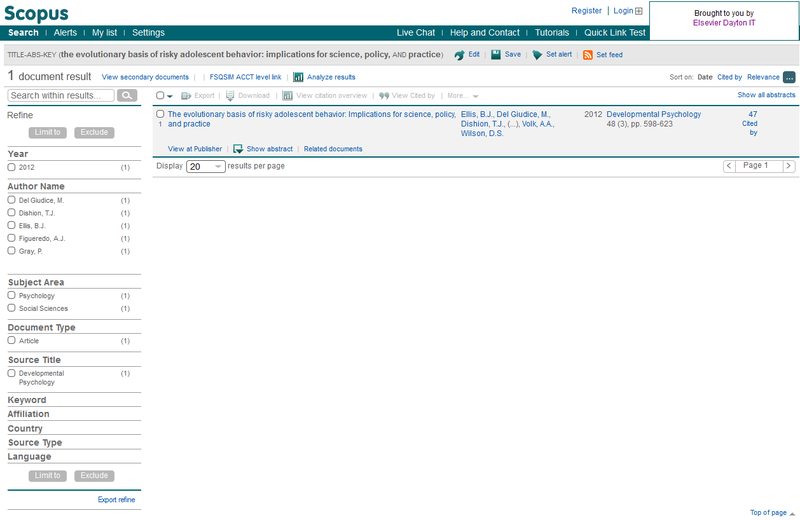 Elsevier’s Scopus database does many things, but for my editorial duties the citation tracking feature helps the most. For any article in the 21,000 titles indexed by Scopus, one can readily find every other article that cites it, and from there find the references for – and citations to – those articles, the references for – and citations to – those articles, and so on. Many of us are familiar with the ISI Web of Science, which shares these features. For me, the primary differences are how quickly new information appears in the database (Scopus is updated daily) and how easy the interface is to use. Scopus has the advantage in both, and both matter for how I use it. When I receive a manuscript addressing a literature I do not know well, I look for a reference to use as the key to my search. I look for one that was published 3-5 years ago in a prominent journal and which every subsequent paper on that topic should have cited. Let’s refer to this article as “Eve.” I search for Eve in Scopus, either using the article title or an author’s name. When I find it, the number of citations to the article appears prominently on the right of the screen. If that number is too small, I know that the literature addressed by my manuscript is too narrow to warrant further review, and I desk-reject it. If the number of citations is large, I do more digging. Clicking on the number leads to a screen listing all of the published articles citing Eve. This screen has proven extraordinarily valuable, and I use the information in a number of ways. First, a quick scan reveals the number of distinct authors citing Eve, which provides an idea of the number of researchers who might find the submitted manuscript worth reading. The same quick scan tells me how well these citing papers have published – this is measured by the titles of the journals in which they have appeared. Second, I can trace the trajectory of the literature growing from Eve to get an idea of whether the submitted manuscript is at the frontier or just fills gaps in the literature. Scopus makes it simple to retrieve abstracts or get to the publisher’s page for the article, so I can find any similarities between already-published papers and the submitted manuscript. As an added bonus, this step would uncover any plagiarism of an already-published article. If these first two steps identify the submission as potentially contributing to the frontier of an active literature, I then assign the paper to a co-editor or an associate editor. Even though the editorial board has broad coverage, sometimes submissions fall into literatures outside of the expertise of everyone on the board. The role of Editor-in-Chief makes me the residual claimant for these submissions, so I have to find reviewers. Because Scopus leads me to every paper citing Eve that has been published in the past few years, and all of these authors are familiar with the literature to which the submission hopes to contribute, this constitutes my reviewer pool. It means I can successfully find reviewers when I know neither the literature nor any of its participants. My primary day-to-day task for Scopus is to learn more about submission-specific literatures, but the database proves useful for ex post assessment of the editorial team. 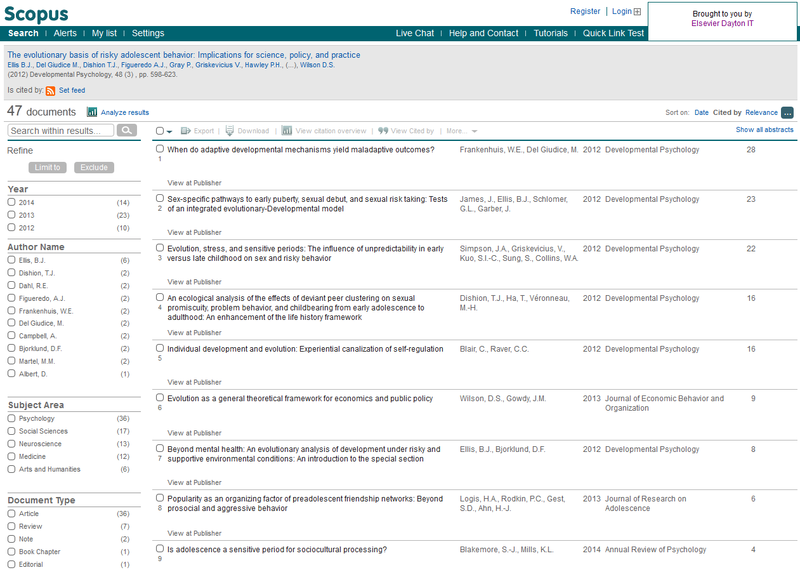 Scopus makes it possible to search by journal title, and it then reports the number of articles published by year. These articles can be sorted by the number of citations they have generated, making it easy to find out which articles are becoming important and which are not. This in turn tells us where we can focus our future efforts. I can also perform the same exercise for aspirational journals to see what topics are becoming hot in the literature. This analysis can inform a number of decisions, from when and whom to add to the editorial board to what special issues to pursue. 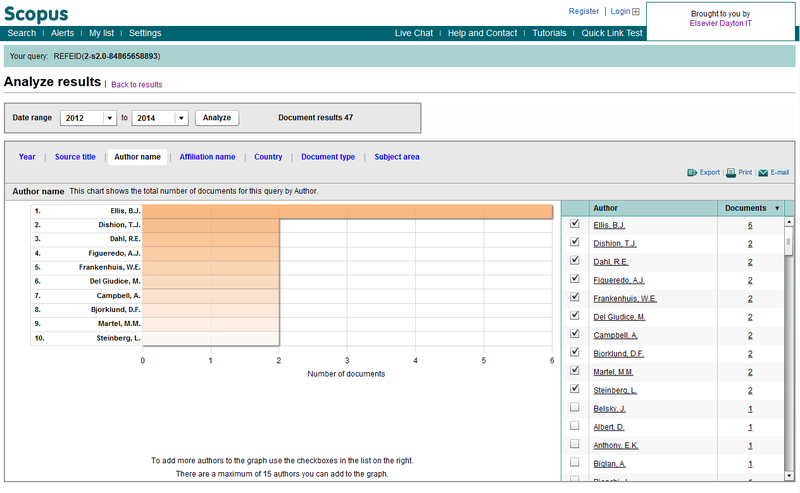 In short, Scopus informs every phase of the editorial process. I would not want to do this job without it, and I intend to continue using it throughout my career. In March this year, Scopus launched the Cited References Expansion project to expand the database's citation data back to 1970. The project is scheduled to run until 2016, when an estimated 8 million articles will have been re-indexed to include cited references. 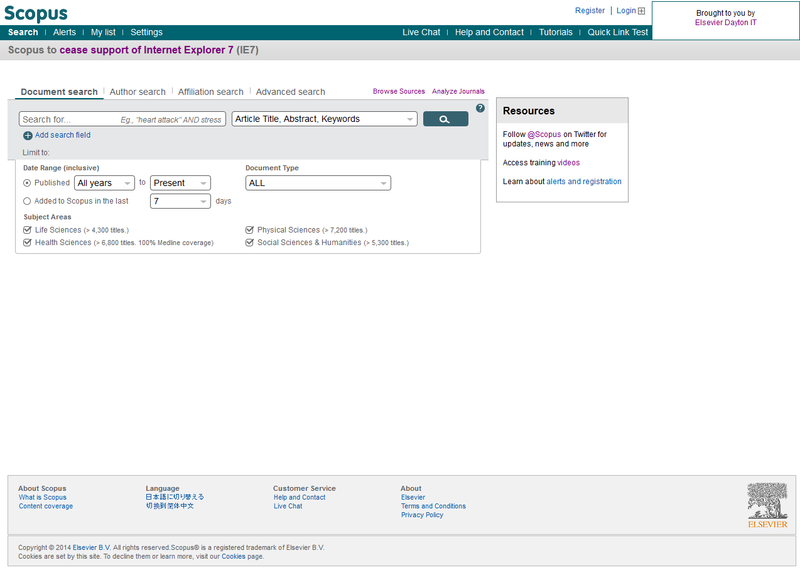 The first of the new content will be searchable and viewable by Scopus users as early as the end of this year. Correct citation data for the archival content will make it possible to measure its impact, perform historical trend analysis and conduct more accurate evaluations of authors who have published prior to 1996. There will also be higher h-index rankings for those senior researchers – many of whom have subsequently become key influencers and decision makers – who published most prolifically before the mid-1990s. (1) Ellis, Bruce J., Marco Del Giudice, Thomas J. Dishion, Aurelio José Figueredo, Peter Gray, Vladas Griskevicius, Patricia H. Hawley, W. Jake Jacobs, Jenee James, Anthony A. Volk, and David Sloan Wilson. "The Evolutionary Basis of Risky Adolescent Behavior: Implications for Science, Policy, and Practice." Developmental Psychology 48.3 (2012): 598-623. Scopus. Web. 14 Aug. 2014. William Neilson is a Professor of Economics and holder of the J. Fred Holly Chair at the University of Tennessee, Knoxville, USA, where he has taught for eight years and serves as department head. Prior to that, he taught for 18 years at Texas A&M University. He has been Editor-in-Chief of the Journal of Economic Behavior & Organization since January, 2011, and served as Editor-in-Chief of Economic Inquiry from 1997-2001. He is an economic theorist specializing in decision theory, game theory, and behavioral economics.